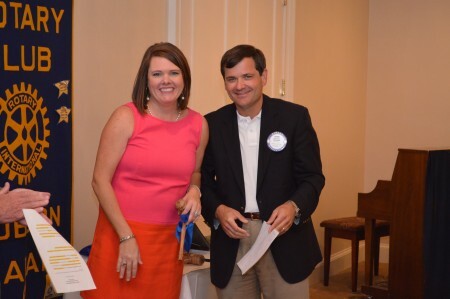 The Auburn Rotary Club recent installed Martee Moseley (left) as its 2012-13 club president. A Rotarian since 2005, Moseley is vice president of community banking with Regions Bank. She receives the president’s gavel from outgoing club president David Reaves (right) as part of the club’s “Passing of the Gavel” ceremony – an annual tradition that this year moved the president’s gavel through the hands of 16 past club presidents in attendance.